Job seekers can submit their Merck careers application for a chance to work for one of the most influential companies in the pharmaceutical industry. Merck has established the quality standard in the entire sector and currently operates worldwide. Its longstanding success has provided the company with a permanent spot on the prestigious Fortune 500 company. According to the company’s official employment policy, all candidates applying for Merck jobs must be at least 18 years old to be considered eligible for the available positions. Please note that all younger candidates will be automatically excluded from the application process. Job seekers can explore the Merck careers portal to find all the opportunities for employment available at the company. They will have to select their preferred employment location, as the portal features job openings from all over the world. Job seekers interested in Merck careers can explore the company’s online employment portal to find the complete list of available positions. They will have to select their preferred job location and then the career area they are interested in and the portal will provide them with the complete list of job opportunities that are in line with their search criteria. Candidates may read the full descriptions of their chosen positions by clicking on the job titles. If they are able to meet the requirements of the Merck jobs, they can submit their application online through the portal to be considered for their chosen positions. This is the first section of the Merck careers application form. Job seekers must fill out a short questionnaire meant to assess whether or not they are able to meet the main employment eligibility criteria of their chosen position. Candidates must answer pre-employment questions for this section of the Merck Careers Application. 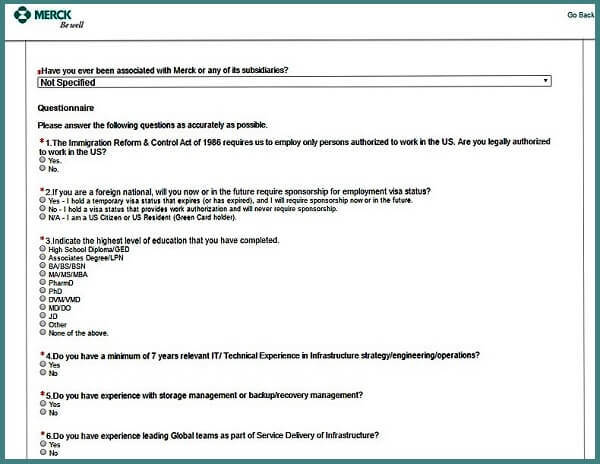 The questions included in the form are about the candidates’ legal authorization to work in the United States and about the professional experience that is required to perform the responsibilities of their chosen positions. Please note that this section is mandatory. All job seekers must fill out the questionnaire to be able to proceed to the following sections of the form. 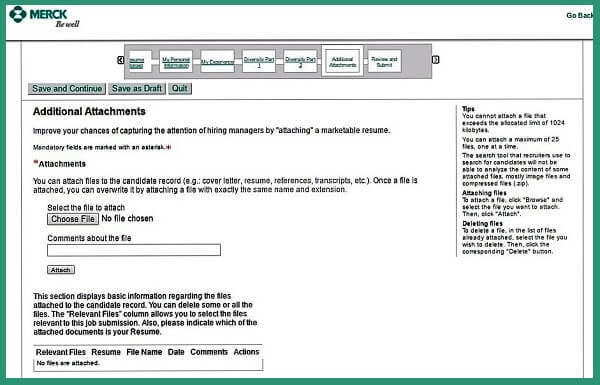 For this section of the Merck careers application, candidates may upload their resumes to the form or they can connect their LinkedIn profiles to the portal to use the data-fill tool. This will automatically extract the relevant information in their forms and transfer it to the appropriate sections in the form. 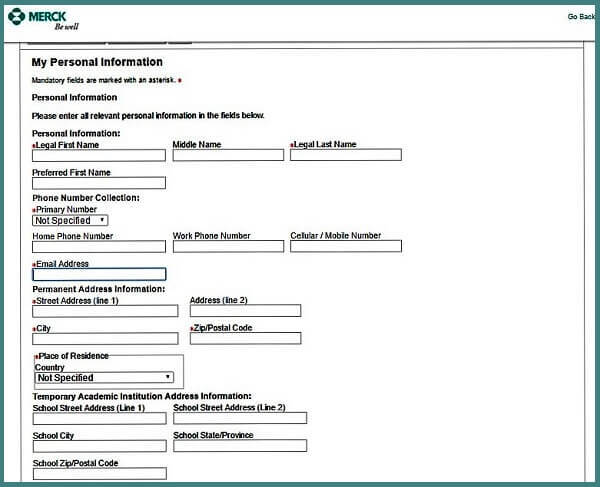 Candidates may upload their resumes to use the data-fill tool provided by the Merck careers portal. Please note that using the data-fill tool is not mandatory. They may proceed to fill out their forms manually if this is a more convenient option for them. The tool is aimed to reduce the time required to complete the employment form. This section of the Merck careers application form requires candidates to fill in their complete contact details. The Human Resources specialists will make use of this information to contact them about the following steps of the application process. As such, it is mandatory that candidates fill out this section completely. Candidates must fill in their contact details for this section of the Merck careers application. 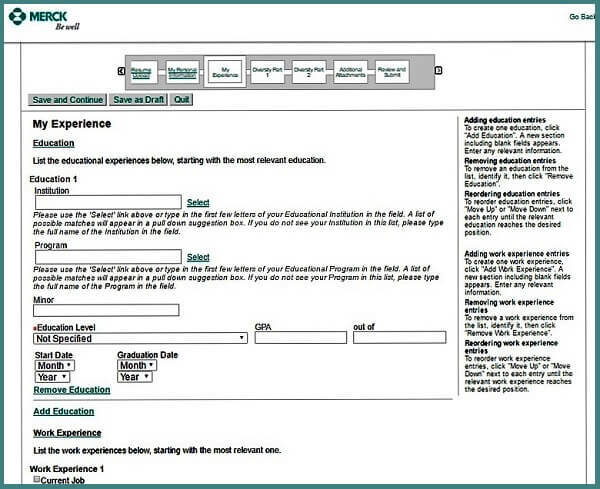 For this section of the Merck careers application form, candidates are expected to provide information about their work experience and their education history. They will have to list their previous employment positions and respectively the main academic programs they have attended separately. Candidates must enter information about their academic and professional history for this section of the Merck careers application. For each entry they make, they will have to include the main details about their experience. This section is aimed to create an overview of the candidates’ professional background. Please note that this section will be filled out automatically by the portal’s data-fill tool. For this section of the Merck careers application form, candidates will be asked to provide information about their gender, race, ethnicity, and protected veteran status, as part of the federally mandated Equal Employment Opportunity questionnaire. Candidates must provide information about their race, gender, and ethnicity for this section of the Merck careers application. Please note that all applicants are expected to choose one of the provided answers for this section. However, they are not obligated to disclose any type of information that they do not want to share with the company representatives. If they wish to keep this information private, they may choose the “I do not wish to disclose” answer. The diversity questionnaires will not influence the outcome of their job applications in any way. For the second Diversity section of the Merck application form, candidates will be asked to provide information about their disability status, also as part of the federally mandated Equal Employment Opportunity questionnaire. As for the previous section, if they wish to keep their disability status private, they may do so by selecting the “I do not wish to disclose” answer. The information gathered from the candidates will be used for statistical purposes and it will not influence the outcome of their hiring process. For this section of the Merck application form, job seekers may upload their resumes, along with all of the additional documents they consider relevant. They can include cover letters, references, copies of their transcripts and diplomas, or any other files that could prove useful for the employment process. Candidates may upload supporting documents for their Merck careers application for this section. This is the final section of the Merck application form, where candidates will get a chance to proofread the information they have included up to this point. They will get to make any modification they consider necessary so that they avoid data inaccuracies. When they complete their reviews, they can submit their forms to the Human Resources department for the formal assessment process. Please note that they will then be able to keep track of their application status on the Merck careers portal to find out when their forms have been reviewed. The Merck careers portal is permanently updated so that job seekers can access the complete list of job openings at the company. They can conduct a personalized search on the portal to find the best-suited positions for their specific experience. Merck internships are extremely competitive because all the bright minds in the young generation want a chance to experience the medical and pharmaceutical sector at its finest. During the program, they will learn new skills and develop new professional abilities that they will later use all throughout their careers. Moreover, the best interns may be offered permanent positions at the company, which makes the program all that more competitive. Merck salaries for interns range between $18.00/hour and as much as $41.00/hour. The exact rate will be negotiated during the interview process according to the specific skills and professional experience of the applicants. Job seekers aiming for Merck managerial careers should be prepared to undergo an extensive selection process, as this is one of the most competitive employment sectors out there. They can submit their job applications through the online portal for a chance to work one of the most successful companies in the medical and pharmaceutical industry. Please note that the specific benefits offer available to employees depends on the career level, employment department, and job location of the Merck employees. The Merck careers form abides by the classic online employment application format. Candidates can opt to use the data-fill tool available on the portal to reduce the time required to complete the online application. This tool will automatically extract the relevant details in their resumes and it will then use this data to complete the My Experience section, as well as other fields in the form. We strongly recommend that they make use of this tool as it will help them complete their forms quicker. However, they should take the time to review the transferred data and make sure that it is correct and complete. 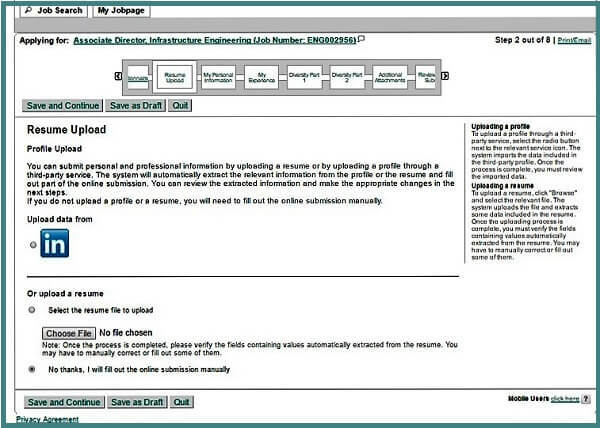 If they do not wish to use the data-fill tool, candidates can simply proceed to the My Personal Information section without providing a resume. They can then attach their CVs to their profiles for the Additional Attachments section. Whether or not they use the data-fill tool, candidates should make sure that they include as much information as possible to the My Experience section. The Human Resources specialists will review this section before they get a chance to see their resumes. Thus, this section is very important because it will influence the Merck employment specialists’ first impression of the candidates. The overview of their professional and academic background will immediately point out whether or not they are properly prepared to perform the responsibilities of their chosen careers. The Merck employment specialists will review the resumes of the candidates who have the required background. The final section of the Merck job application from is very important because candidates will get to review all the information they have provided up to this point. 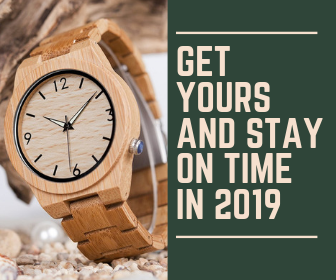 They will get to correct any spelling and grammar mistakes they may have made so that they submit the best possible version of their applications. When they submit their Merck careers applications, the information provided by the candidates will remain saved onto their profiles. They can then apply for a second Merck career by using the same profile. The only sections they will have to fill out again are the employment-specific questionnaire in the first section and the Equal Employment Opportunity questionnaire. The Merck employment specialists will review the job applications they receive and they will hand-pick the best candidates for the available positions based on their professional experience and their level of compatibility with the company. They will then contact them and schedule them for the interview process, which is this following step of the hiring process. The number of job meetings that applicants will be asked to sit through depends on the career level and department targeted by the candidates. They should expect to be called in for as many as four meetings if they are aiming for a high-level position. Candidates preparing for Merck interviews should conduct comprehensive research on the company’s development background and the main projects they are focusing on at the moment. This will enable them to include valuable facts in their interview answers and make a good impression on the Merck employment specialists. They should also be able to describe their professional experience in great details, as this might also be necessary during the interview. It is ideal that they correlate their experience with the main requirements of their chosen positions. This will prove extremely useful because they will know exactly which part of their experience they should focus on. The candidates’ interview attire is also very important. They should aim to correlate their outfits with the type of career they are applying for. As such, candidates aiming for entry-level positions should wear business casual attire, while those interviewing for managerial positions should wear formal outfits. Candidates can improve their interview answers by practicing with interview questions that have been previously used in Merck job meetings. This will improve their performance because they will be able to give more complex answers. We have selected a few general questions that the candidates can use for their preparation process. Please note that they will also receive psychological questions and employment-specific questions during their job meetings. They should be prepared to go through an extensive screening during the Merck hiring process. Why did you decide to apply at Merck? What do you think makes you a suitable candidate for Merck employment? What do you know about Merck? Are you familiar with our latest projects? Could you please tell me about a time when you have dealt with a difficult customer? How did you handle that situation? Could you please tell me about a stressful situation you have dealt with during your professional experience? How did you overcome it? How do you handle work-related conflicts? What can you tell me about yourself that is not included in your Merck application?